Discussion in 'Trend Spotting' started by poule, Apr 1, 2009. They look like they would be very heavy to walk with, i'm not a fan of them but as you said never say never! im buying some when i get some money some classic ones with the crepe sole and D-rings. i already have some creeper style shoes from office only thing they're missing is the crepe sole. A lot of "punk" guys and girls wear them where I live, but I never really gave them much thought until they began to pop up on fashion blogs. I actually really like them. I'm planning on getting the low ones because I don't think I can pull off a pair that are high. way too cartoonish for my taste, and I think I saw some goths wearing these which says enough. i believe that's the point--these are costume-y shoes that are very scene specific. i've been around them for a while, never liked them on me b/c even tho i know the context of them i can't help but be reminded of frankstein's monster when i see 'em--and i doubt anything is going to change that. plus i just dislike platform shoes more and more now unless they're like bal-boots from 06 or something. I hate these shoes so much. haha yeah they do resemble Frankenstein ! I never thought about that before. I'm not sure if I'll actually go through with the purchase, but I always love to experiment with shoes. I totally agree, never say never when it comes to fashion. I bet in 2 years everyone will be sporting them. okay if I can't say never when it comes to fashion, what about "I don't think I could wear that?" 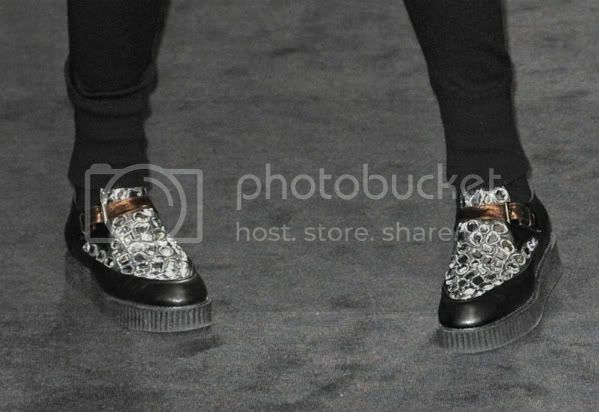 Creepers are a perfect example of something that I have never wanted to wear, but I like seeing other people wear them. They are very scene-specific, to my mind; it will be interesting to see if they can be "re-branded." They look like something you would buy at Hot Topic. Therefore, I loath them with every fiber of my being. Yes, I used to shop at Hot Topic when I was an adolescent. A very deeply misguided adolescent. but not on me ! not on me at all !! I think it will be mainly punky people wearing them this time around as well, can't see them taking off much. My dad has a leopard print pair. He wears them with skinny jeans. He's pretty cool my dad.